Beauty Treats’ mission is to offer customers quality makeup at affordable prices. The company strives to be different from mass market brands, so they requested the assistance of Ready Artwork. Our team is continuously developing a wide-array of innovative cosmetics and creative packaging that suit all ages and skin types. Beauty Treats has been a longstanding client of Ready Artwork’s and both companies have enjoyed creating eye-catching designs for the brand. The challenge for this packaging design was creating a creative and unique look for each of the products while delivering the same brand message, look and identity. Another challenge is that Ready Artwork and Beauty Treats look several quarters ahead. This project was under development in quarter 2 of 2015 while designs and ideas for quarter 4 were also being established. Ready Artwork’s design team collaborated with the Beauty Treats team to include special packaging for the products. 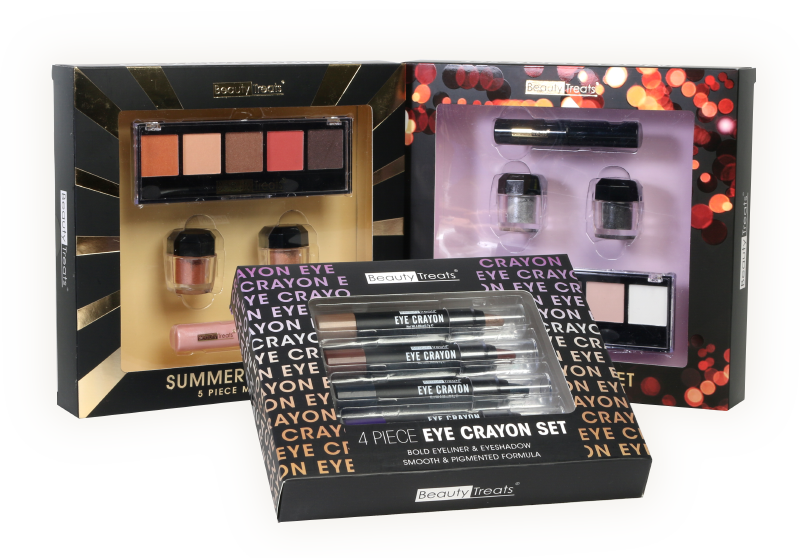 Gold metallic foil-stamping was used on the “Summer Look Set” and spot UV was used on the “Eye Crayon and Smoky Look sets.” The printing techniques gave the packages a unique but brand-consistent look that stands out on the shelves of retail stores that carry Beauty Treats products.